After the acclaimed release of his latest album ‘From Africa with Fury: Rise’ (Because Music) and his rave appearances at the Royal Festival Hall and on BBC 2’s Later with Jools Holland earlier this year, Seun Anikulapo Kuti returns to the UK for two live appearances in November. His latest album “From Africa With Fury: Rise”* which came out this April was produced by Brian Eno, John Reynolds, and Kuti, with additional production by Godwin Logie. The critically acclaimed album captures Seun and Egypt 80’s extraordinary power, fraught with the scorching rhythms and kinetic funk energy that has earned the band worldwide acclaim as one of today’s most incendiary live acts. The success of Seun’s recent activity in the UK resulted in a MOBO nomination for ‘Best African Act’. 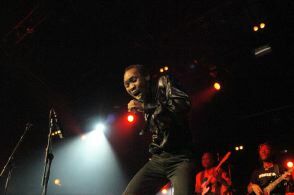 Seun Kuti will release the blistering ‘Rise’, his first single from the album, on the 7th November. The package features a remix of the track by the US DJ and rapper, Swizz Beatz. On ‘Rise’, perhaps the album’s most unequivocal battle cry, Kuti impels listeners to fight “the petroleum companies” that “use our oil to destroy our land,” “the diamond companies” that “use our brothers as slaves for the stone,” and “companies like “Monsanto and Halliburton” which “use their food to make my people hungry.” But where Fela’s work often featured an explicit call to revolution, Seun’s goal is subtler. He sees his role as that of an educator, speaking truth to power in order to provoke awareness and debate throughout his beloved homeland. Formed in 2006 by a group of long time friends – drummers, DJs and musicians – Yaaba Funk play an original and contemporary mix of Ghanaian Hi-Life, Afrobeat and low-down dirty funk. Yaaba Funk bring a Brixton vibe to their performance and are influenced by the greats of West Africa such as Fela Kuti and Alhaji K. Frimpong as well as the US funk of George Clinton and the punky energy of UK acts such as the Specials. Their self-produced debut album ‘Afrobeast’ was released in May 2010 through influential British record label Sterns. Seun Kuti, in conversation with Prof. Stephen Chan and Dr. Lucy Duran, at The School of Oriental and African Studies. This event has been organised by SOAS Radio and The Centre for African Studies at SOAS with Because Music. Please contact gerry@glpr.co.uk for details.